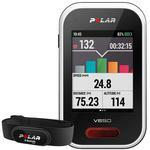 The Polar V650 cycling computer is the newest and best GPS enabled computer you can possibly use while cycling. It computes & displays various ride data like heart rate, speed, distance, and altitude. It navigates and delivers more accurate GPS-powered speed and distance data and syncs with compatible accessories like your HR strap. For devoted cyclists who want to analyze every aspect of their riding and boost their cycling performance.